Production on Alien: Covenant is well underway in Australia. 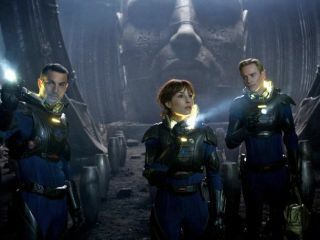 Ridley Scott is back at the helm of the Alien prequel that picks up with a new crew some years after the events of 2012's Prometheus. For this next bout of deep space terror and alien savagery there will be, of course, one familiar face: the android David, played by Michael Fassbender who has been speaking about the shoot and what we can expect from the eagerly-awaited movie. “There are going to be great sets and aliens coming out of people," he tells Inquirer.net, which is all we wanted to know really. After Scott promised that every type of xenomorph will appear, there were concerns (well, *I* was concerned) that he'd backtrack and we'd be left with more of those half-Engineer/half-Starfish creatures from Prometheus. It sounds like Scott is reverting back to the grungy "truckers in space" aesthetic that made Alien so distinctive. You've got a spaceship crew on low pay, tasked with delivering expensive goods. Now that it's been confirmed the Covenant is manned with Weyland-Yutani employees, it's pretty much guaranteed that this crew - like the Nostromo's - will be expendable. Directed by Ridley Scott and starring Katherine Waterston, Michael Fassbender, Demian Bichir, Carmen Ejogo, Jussie Smollett, Amy Seimetz, Callie Hernandez and Danny McBride, Alien: Covenant will open in the US on August 4, 2017 with a UK debut date still to be determined.